Right now, the United Kingdom is a tale of two countries. The UK voted to leave the European Union by a final vote of 51.9% to 48.1%. The map below shows how the vote swung in each region of the country — you could almost rip the country in half. 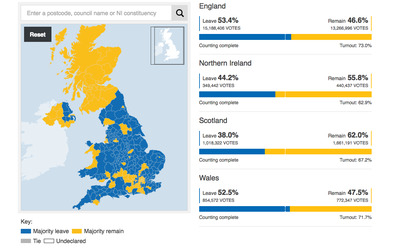 Scotland, Northern Ireland, London, and other major cities in England had Remain majorities. Leave won the majority of votes in Wales and England. The historic decision to leave the EU has caused chaos in global markets Friday morning. You can follow our live coverage of the aftermath of a Brexit vote here.